It all started in January of last year with whispers that Akinbiyi, then at Stoke, was Steve Cotterill’s choice to come in as a replacement for Robbie Blake who had gone to Birmingham at the beginning of the month. I think it is fair to say that it was not greeted with great delight by many Burnley fans and it was with some relief when we heard he was set for Sheffield United in what many thought was an inflated £600,000 deal. The rumours wouldn’t go away though, and they increased as Neil Warnock got more and more edgy when he couldn’t complete the deal. Then on 17th February, Burnley confirmed they had made a bid for him, and a week later he became a Claret. Well if nothing else, we had got one over on Warnock, and many thought it was worth it just for that. Even so, we couldn’t wait to see him in action, but in the end we had something of a wait. Two days after we completed the signing he was ruled out of our game at Preston with injury, and he had a watching brief again in the following midweek as we went out of the cup at Blackburn. 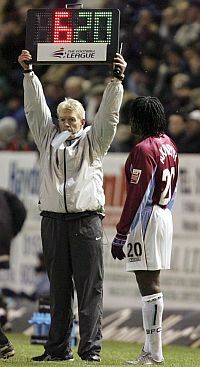 That gave Ade a glimpse of the passion around Turf Moor and it left him ready to get into the action. He was named as a substitute against Sunderland on the Friday in a game shown live on Sky television. With the Clarets trailing 1-0, and with just ten minutes to go, Steve Cotterill decided to replace Michael Duff and Ade Akinbiyi’s Burnley career was underway. It was a stunning debut that lasted just over two and a half minutes. In that time he missed a good headed chance, made a good run, was pulled up for a foul that should have been given the other way, and then just over the touchline he elbowed George McCartney before grabbing him by the throat and then head butting him. Referee Iain Williamson had no option but to send him off, and I’m just so pleased I wasn’t within earshot of a clearly angry Steve Cotterill on the touchline. It meant another three games without him and that included games against two of his former clubs Leicester and Wolves. He wasn’t named substitute again by the Clarets, and after completing the suspension he didn’t miss another game until last week’s defeat against Preston. That run started at, of all places, Bramall Lane and although the Clarets were beaten (when are we not beaten there) he scored his first Burnley goal. 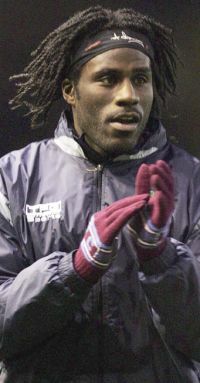 By the end of the season he had added another three goals and had given the Burnley fans enough to suggest he might make an impact when the 2005/06 season got underway. Both he and Steve Cotterill had admitted that he’d finished the season without being fully fit. When that new season did get underway he was soon amongst the goals. Another against Sheffield United was followed by a late brace against Coventry. Now I think it is fair to say that the Coventry defence was not the best but Ade’s performance that day was his best yet, and how he deserved those goals. He had the Coventry defence ragged and they didn’t know whether they were coming or going by the end of the game. He run them all over the place and I remain convinced that by the final whistle one of their back four was somewhere in the town centre with another up in Towneley Park. He’s gone on since to score some vital goals for us, three times he’s scored the only goal of the game to earn us the three points and he’s also twice scored in games that have ended in draws. 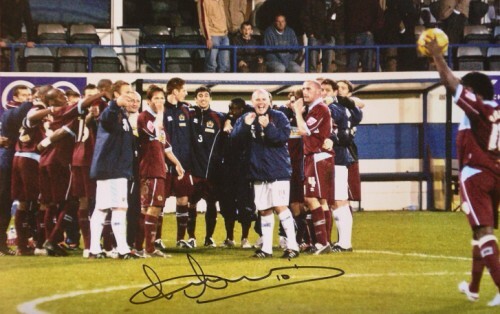 He also got the late, late winner in the Carling Cup against Carlisle that ultimately led to a trip to Aston Villa. Then there was Luton, and no Burnley fan there that day will ever forget it. This was the day when, against all the odds and with no goalkeeper, the Clarets beat a side previously unbeaten at home. We defended superbly, John Spicer just about handled being in goal following the sending off of Brian Jensen, but up the other end of the pitch Ade turned in what can only be described as a magnificent display of forward play. Twice he got on the end of balls from John Spicer (whilst Spice was still in midfield). The first time he slotted the ball home past former Claret Marlon Beresford. As far as the second is concerned, I’m convinced Marlon is still looking for it as he hit it with such power from the edge of the box. In the second half, and down to ten men, he played down the left hand side of the pitch but was still able to complete his hat trick from the penalty spot. He’d won the kick himself after another excellent run and although he claims to have been reluctant to take the spot kick he made no mistake with a shot into the corner. At the end of the game he collected the match ball before joining the post-match huddle, and received ovations from his team mates, the Burnley fans, and also the Luton fans. We all knew we had seen something special. In the very next game he came close to scoring an even better goal against Leicester as he powered home an incredible effort from the tightest of angles. Unfortunately, and astonishingly, referee Matt Messias disallowed the effort and in doing so robbed us of a fantastic Turf Moor goal. There was just one more goal to come on the Turf and fittingly it was against his former club Stoke City. It was on Boxing Day and was our last win, and Ade scored from close range following a cross from the right wing. That silenced his former fans but for us, we could have had no idea it would be his last goal in a Burnley shirt. There should have been more, his misses at QPR and Derby were not in keeping with his form this season, but by then the speculation had started regarding a move to Sheffield United. This time Warnock has got his man – paying almost three times the amount we spent less than a year ago. Ade has gone but he’ll certainly not be forgotten. Some Burnley fans were pleased when we signed him, others were not, and some, including myself, were very cautious. His reputation, names such as Akinbadbuy, had probably influenced us. It is very fair to say that I was quickly won over, Ade proved to be a far better player for us than I ever thought he would be. He has certainly left with more supporters than when he arrived, all won over by his performances and his attitude and commitment, and I don’t think you will find many Burnley fans who are happy to be losing him. Many of us realise it is a big fee, and that the club could hardly turn it down, but just like the manager we would definitely have preferred it if we could have kept him. And I think we might have chosen a better club for him to go to if he did have to leave. I don’t know whether he’ll ever play on the Turf again for any other club, but if he does then I’m damn sure he’ll get a fantastic reception from the Burnley fans. It will be so deserved. 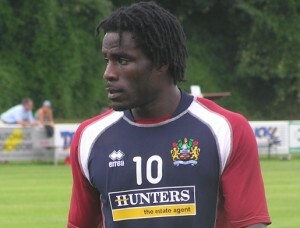 Our best wishes to you Ade, and our thanks for the last eleven months, and a special thanks for Luton.